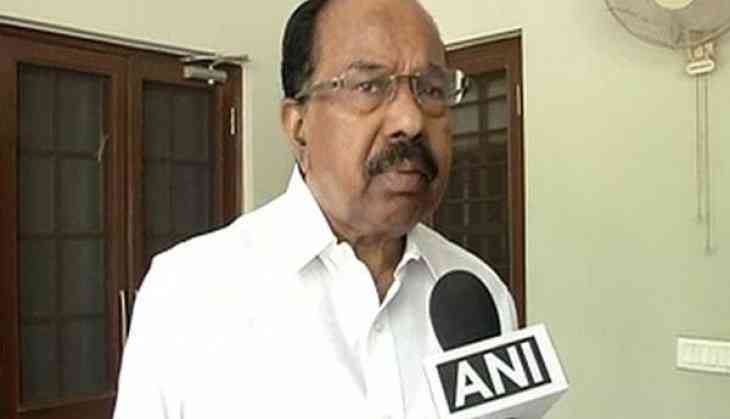 A day after he dubbed as "populism" the tirade against Electronic Voting Machines (EVMs), Congress leader and former law minister M. Veerappa Moily on 12 April said technology needs to be updated on a continuous basis while stressing that going for the manual is not a progressive step. Moily emphasized on the formation of a very high power committee, which must look into all technicalities. "Technology needs to be updated from time to time. We have to go forward. I think there needs to be a very high power committee, which has to go into the technicalities. There is no question of getting back to the manual methods, manual voting patterns. Going for the manual is not a progressive step, we have to go forward on the technological line." Moily told ANI. Asserting that India's electoral system is the best, Moily said the credit for the same should always go to the former UPA regime and the Congress Party. "We should know that the electoral system in our country has come to stay (and) that credit should go to the UPA and also to the Congress Party. The Congress Party has always been for an improvement in technological reforms and transformation which we have already gone in that wavelength. I don't think we should go back it's my personal view, but at the same time we need to look into these complaints," said Moily. "Perception should not persist and by far which you know very super high power committee of technical people will have to be deployed and then after we can get the report," he added. Another Congress leader Shakeel Ahmad, however, avoided commenting on his party colleague Moily's assertion and said that this might be his personal opinion. "This can be his (Moily's) personal views, but the Congress Party is very clear that this is the responsibility of the Election Commission to solve and find out the conclusion of this doubt. The Election Commission must ensure the citizens of India that there is no problem with the EVMs, otherwise democracy will be in danger," he said. Moily had earlier in an interview vented his ire on the Congress Party's decision to join the chorus against EVMs, calling it a "defeatist" mindset while arguing that the voting machines are beyond doubt. Earlier on Monday, the Congress Party emphasized on using ballot paper scrutiny instead of using electronic system while stating that they have faith in the Election Commission of India, but not on the EVMs. In a meeting with the Election Commission officials, a team of top opposition leaders had on Monday put forward their demand of using ballot papers instead of EVMs in the upcoming elections in view of the alleged tampering.